SURPRISE ANNOUNCEMENT: THERI'S MAKERS ARE BACK WITH AN INTERESTING MULTI-STARRER COMBO! With Theri and Kabali proving to be successful for him, Kalaipuli S Thanu came forward with Vikram's Sketch last year. Recently, we had also reported that he will be bankrolling Dhanush's next. But meanwhile, the stalwart producer had other ideas! He surprised the audience with the announcement of his next project which is already ready for release in August. This film has been directed by Radhamohan of Mozhi fame. Fascinatingly, this film will have an interesting ensemble that includes the likes of Vikram Prabhu, Prakash Raj, and Samuthirakani. The film has been titled as 60 Vayadu Maaniram and will have music by the Maestro Isaignani Ilaiyaraaja. Vivek Anand will be handling the cinematography, while Jai will take care of the cuts for this film. The already exciting cast list also includes the likes of Indhuja, Kumaravel, Mohan Rajan and many others. Viji has written the dialogues for this film and to support Ilaiyaraaja's tunes, lyricists Pa Vijay, Vivek and Palani Bharathi have contributed their words. The art for this film has been done by K Kathir. 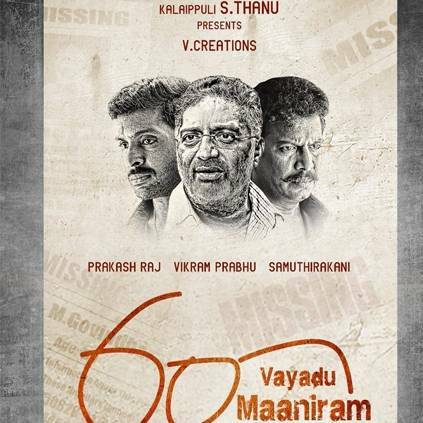 To make this announcement, Thanu took to his Twitter handle and said, "Very proud to present this movie #60VayaduMaaniram. I am sure everyone will like this! @iamVikramPrabhu @prakashraaj @thondankani #RadhaMohan #IsaignaniIlaiyaraaja"
Now this is a project we can look forward to. Notably, Radhamohan has just completed filming for the Tamil remake of Vidya Balan's Tumhari Sulu, which has Jyothika in the lead. People looking for online information on Ilaiyaraaja, Kalaipuli S Thanu, Prakash Raj, Radhamohan, Samuthirakani, Vikram Prabhu will find this news story useful.